At a wedding, all eyes will be on the bride as she glides down the aisle looking radiant in a fabulous gown, flowing veil, and stunning crystal necklace. Even as gorgeous as the bride will be, the ceremony site can still benefit from some pretty decorations. After all, a beautiful bride deserves a beautiful background. 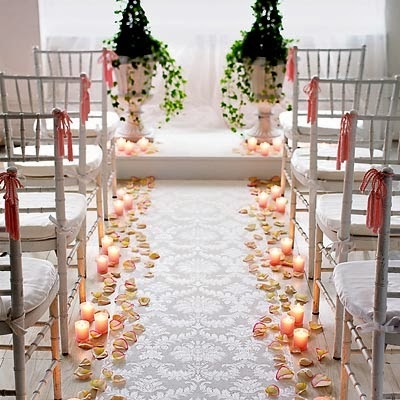 Set the stage with these wonderful ideas for wedding ceremony aisle decorations. 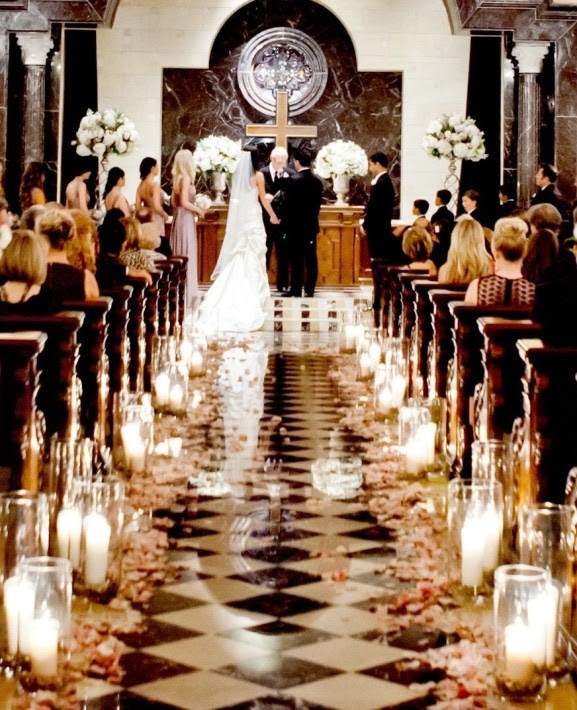 When your wedding is in a church, it will likely have a very well defined aisle. 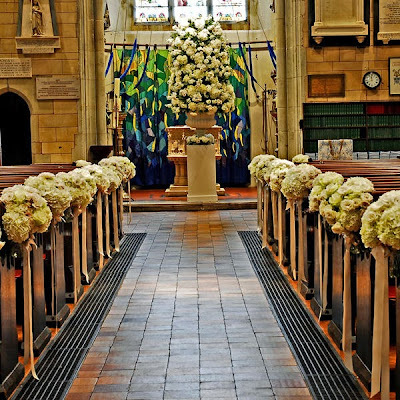 The most traditional decorations are bows and flowers on the end of the pews. 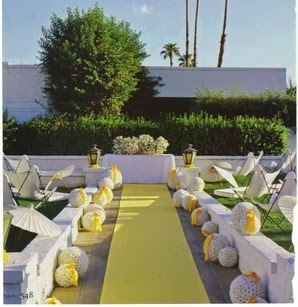 This classic wedding decoration always looks pretty. If you wish to save money, pew decorations can be placed on alternating rows, starting with the pew closest to the altar. Be sure to find out your church's rules about how pew decorations may be secured, because many ban the use of staples, nails, and tape on their pews. 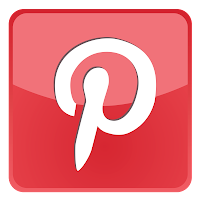 What if your church does not permit any type of pew decorations? Freestanding decor is the answer. Create a tropical feeling by lining the aisle with potted palm trees with tiny white lights in the fronds. Or use shepherd's hooks to suspend small vases of fresh flowers. For a Winter Wonderland wedding, it would be stunning to set tall white branches in heavy bases lining the aisle. Scatter teardrop shaped crystals among the branches for a spectacular effect which is a fabulous complement to a crystal necklace and earrings. Always take care to ensure that freestanding aisle decorations neither block the view from the pews nor make the aisle too narrow to navigate. 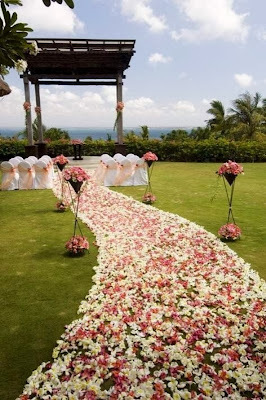 If the wedding ceremony is to be held outdoors, you may wish to take more steps to define your aisle with decorations. 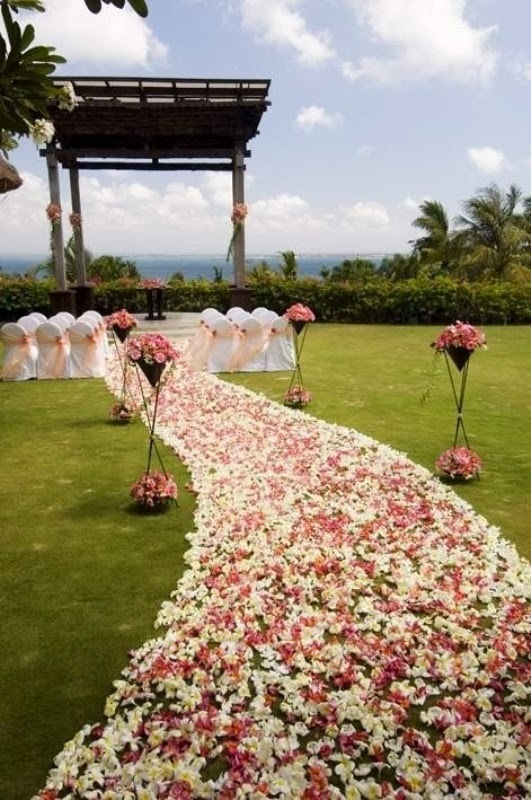 A simple but striking effect can be created by lining the sides of an aisle over grass with a border of red rose petals leading all the way down the aisle to the altar. Have the ushers seat guests from the outside of the rows instead of the aisle side so that the petals will not be disturbed before the start of the ceremony. A great addition to a rose petal lined aisle would be floral pomanders suspended on the sides of the chairs lining the aisle. Hang the pomanders with pretty shimmery organza bows for a special extra detail. 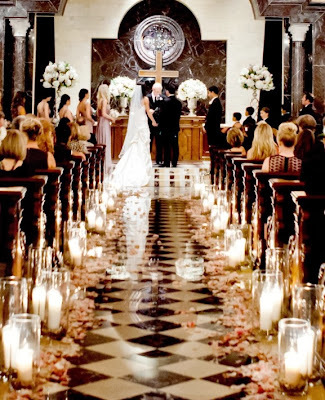 Candles can be lovely aisle decorations as long as they are used safely. As I once attended a wedding where the bride nearly caught her train on fire in one of the candles lining the floor of her aisle, I would advise against open flames. However, closed lanterns work beautifully to house candles, and the lantern itself will be an extra element of style. Tall lanterns with large pillar candles can be placed on the ground lining the aisle, or use shepherd's hooks to hang smaller lanterns along the sides of the chairs. Either way, a candlelit aisle will be very romantic. There are many other beautiful aisle decorations to consider. A special monogrammed runner will add a touch of regal elegance to the ceremony. Cute wicker baskets filled with daisies would be absolutely charming for a country wedding. 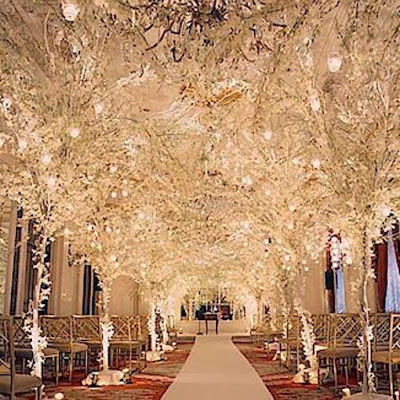 Special aisle decorations will help to make the wedding processional feel even more magical.